'Maharshi' is the title chosen for Mahesh Babu's landmark 25th Movie under the direction of Vamshi Paidipally. Allari Naresh is doing a crucial role of Mahesh's Friend in this biggie. 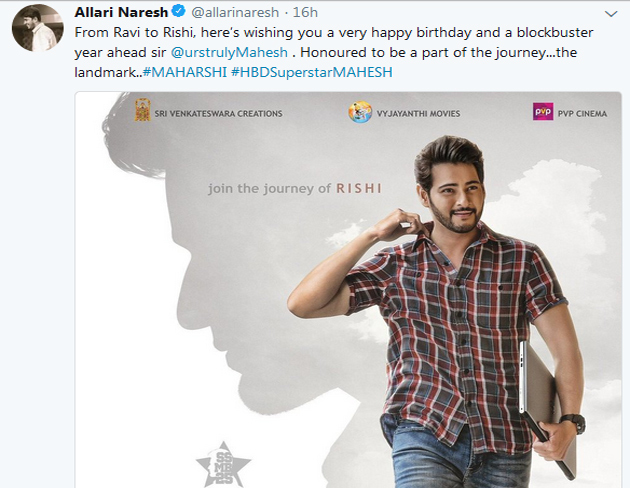 While conveying birthday wishes to Mahesh Babu, Allari Naresh disclosed his Screen Name in 'Maharshi'. 'From Ravi to Rishi, hereâ€™s wishing you a very happy birthday and a blockbuster year ahead sir @urstrulyMahesh . Honoured to be a part of the journey...the landmark..#MAHARSHI #HBDSuperstarMAHESH,' he wrote. Allari Naresh is always willing to take up interesting Supporting Character Roles. Films like 'Gamyam' and 'Shambo Shiva Shambo' fall in the same category. If the speculations are true, Combination scenes of Mahesh Babu and Allari Naresh will be highly entertaining. Story takes a serious turn after the death of Allari Naresh.